Whose on first? Or rather who was born first and can you tell? Does it make a difference? Birth order has been the subject of research and speculation for years. 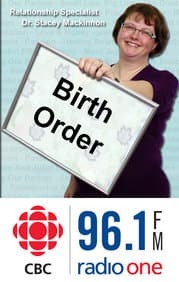 Relationship expert Stacey MacKinnon looks at the realities behind birth order and behaviour. Stacey MacKinnon teaches in the psychology faculty at UPEI. Do you have a ritual in your life? Rituals can cost nothing but can benefit others and they're even good for your health. Dr. Stacey MacKinnon, our relationships columnist will be here to tell us about the importance of rituals and how they can benefit your health and happiness. Is your partner "always" late?... do they "never" remember? Mainstreet's Dr. Stacey MacKinnon dropped by to warn Karen Mair about the use of catastrophic language.